Merion Investment Partners III, L.P., is excited to announce a new investment in Radius Global Solutions. 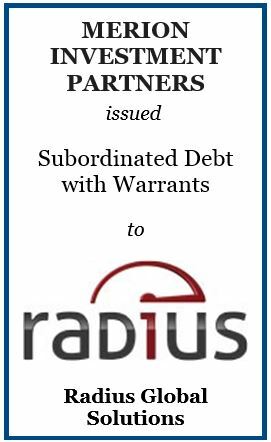 Merion provided subordinated debt to support the merger between Radius Global Solutions and Northland Group. Radius Global Solutions, headquartered in Blue Bell, PA, is a global technology-enabled provider of end-to-end accounts receivable and customer relationship management solutions. The company merged with Northland Group, a Minneapolis, MN based provider of accounts receivable and customer relationship management solutions primarily in the financial services sector.